Frank Hugus earned his doctorate in Germanic Languages and Literatures from the University of Chicago. 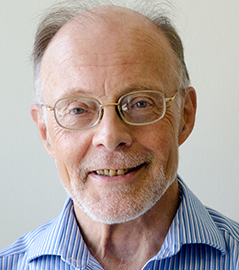 He has been offering courses in Scandinavian and German subjects at the University of Massachusetts Amherst since 1970. Over the years he has taught a wide variety of courses ranging from "Old Norse" to “Scandinavian Mythology” to "Hans Christian Andersen" to "The History of the German Language" to "Trolls, Giants, and Dwarves" (to name only a few). He has received several research grants (including Fulbright, American Council of Learned Societies, and National Endowment for the Humanities awards) for research projects in Denmark and Iceland. His main area of research is currently 19th and 20th century Danish literature, but he has also published articles on a variety of medieval Icelandic literary topics. In addition Hugus has translated a number of novels and short stories from Danish into English. He is currently completing a translation of Hans Christian Andersen’s debut novel, “The Improvisatore” (1835). “La critique sociale dans les romans de H.C. Andersen,” Etudes Germaniques, 58ième année, numéro 4, pp. 621-635, 2003. "Hans Christian Andersen: traducteur et adaptateur,” (Re-)lire Andersen: Modernité de l’œuvre, Klincksieck, pp. 297-316, 2007. "Some Thoughts about One Danish Novelist’s Observations on the Human Condition,” Vox Germanica: Essays in Germanic Languages and Literature in Honor of James E. Cathey, eds. Stephen J. Harris, Michael Moynihan, and Sherrill Harbison, ACMRS: Tempe, 2012.